General Hospital Spoilers: Shiloh’s Murder Mystery Kicks Off – Who Kills Creepy Cult Leader? General Hospital Spoilers: Drew Garrett’s GH Return as Morgan Corinthos – Perfect Replacement For Bryan Craig? 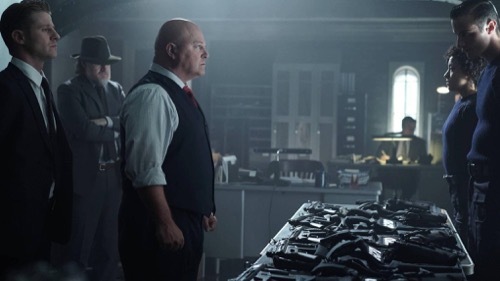 Tonight on FOX Gotham continues with an all new Monday October 19, season 2 episode 5 called, “Scarification.” and we have your weekly recap below for you. On tonight’s episode, Galavan (James Frain) and Penguin (Tioka Bernard Schluter IV) join forces with a dangerous family. On the last episode, Barnes formed a task force with help from Gordon; Penguin was kept busy trying to fulfill a favor for Galavan; and Nygma asked Kringle out on a date. Did you watch the last episode? If you missed it, we have a full and detailed recap right here for you. Don’t forget to join us for our live recap tonight at 8:00 pm when Gotham airs on Fox. While you wait for the recap, check out a sneak peek of tonight’s episode below! Tonight’s episode of Gotham kicks off with Theo meeting with Penguin, he has brought along a trunk for Theo. Penguin pleads with Theo to let his mother come home, he promises to still do his bidding for him if he brings his mother home safe. Theo scoffs that the answer is “no” and says Penguin on his way. After Penguin leaves, Theo opens the trunk that he brought him. Mr. Bunderslaw climbs out – Theo informs him that he is going to tell him all of Wayne Enterprises’ secrets, or else he will be tortured. Then, he has Tabitha cut off one of Mr. Bunderslaw’s hands. Meanwhile, James Gordon and the police are raiding some sort of underground operation where men are counting tables full of cash. One of the perps has a rocket launcher, the new Captain is shocked. Harvey jokes, “Welcome to Gotham.” Once they take the men in, Gordon informs Captain that they got the rocket launcher from an illegal weapon ring called “Merk,” they have never been busted because they pay off half of the city council. The captain isn’t phased, he says that they will raid Merk tomorrow. Penguin gets word that his townhouse has been raided and the Gotham police took everything – he beats the messenger that delivered the news with a fire poker. Back at the precinct, James tells Leslie that he has to do another strike with Captain Barnes that night. Leslie says that tonight is their date night. Before James can shut down date night, Ed arrives – he says that he wants to double date with them and his girlfriend Kristen Kringle. Leslie invites them over to her house for fondu. Theo stops by the precinct, he tells Gordon that he needs to talk to him in private – he says that he is still upset about what happened at the gala. Theo can’t sleep at night after he had to kill someone at the gala. Gordon reassures Theo that he did the right thing, and eventually it will get easier. Theo says that Gordon is honorable, and he wants him to endorse him for mayor. Gordon turns Theo down and says that he doesn’t do endorsements, because police and politics don’t mix. Tabitha pays Penguin a visit – he is furious about losing his money, he says that someone must have betrayed him. Tabitha says she has a job for Penguin, she hands him a list of addresses and tells him that it is a list of buildings that he has to burn down … tonight. She hands him a box with Mr. Bunderslaw’s hand in it and tells him that whoever he has start the fires is going to need it. Penguin is on the job, he sends his henchman Gilzean to find the Pikes – they are the best arsonists in town. He goes to Selina and asks for her help getting the Pikes on board. Selina takes him to visit the Pike brothers, who are still bitter about Fish’s murder. When the Pike brothers learn how much cash is at steak, they agree to the job without any hesitation. Selina finds Bridget Pike outside crying, her brothers treat her horribly and are abusive. Before Selina leaves she tells Bridget to take care of herself and “be strong.” Meanwhile, the Pike brothers head to the Merc to pick up supplies for their night of arson. While they are there – Barnes and Gordon show up to raid the warehouse. Gordon and Barnes chase down the Pike brother and he pulls a gun on them, they fire back and he explodes. He had pocketed a grenade while he was in the Merc and it exploded when he was shot. It’s time for date night, Ed and Kristen arrive at Leslie’s house for fondu. Gordon shows up late for dinner – he apologizes profusely for being late. Leslie takes Gordon aside and tells him that it hasn’t been that bad, with Kristen by his side Ed maintains some sort of cool vibe – which is not usual for him. The older two Pike brothers are furious that they lost their brother the night of their big job – they needed him because he was so small and skinny. They inform Bridget that she just got a promotion, and she is going to have to help them out tonight when they burn down the list from Penguin. Bridget objects, but they threaten to pimp her out if she doesn’t help them with the family business. Bridget and her brothers head out, they send her in to the building and give her instructions on how to light the bomb over walkie talkies – she uses Mr. Bunderslaw’s eye to open a safe and take out a knife before she barely gets out of the building alive. Her brothers don’t seem to care that her leg got burnt – they tell her to get in the van, they have four more buildings to burn before the night is over. Selina drops the knife off at Penguins that Theo had stolen – Penguin is certain that it might be a clue to help him take Theo down. Madam knows why the knife is important, she says that it is cursed. Many years ago, there were 5 families that run Gotham. Celestine Wayne took a lover from another family, Caleb Dumas. When she got caught with him – she lied and said he raped her. The Wayne brothers were mad with rage and tortured her lover and ran the Dumas out of Gotham. The Dumas changed their last name to Galavan – just like Theo Galavan. That is why he is trying to take over Gotham now, and Wayne Enterprises. Penguin has a plan, he tells Butch about the knife and Theo. He tells Butch that he has to go tell Galavan that Penguin fired him and thought he was a traiter. Then, Galavan will hire him and let him inside his organization – then he can find Penguin’s mother and bring her home safe. Butch argues that Galavan is not going to buy it. Then, Penguin takes out a cleaver and chops off his hand so that Galavan will believe that they are no longer working together. Meanwhile, the Pike brothers are on another fire starting binge. They send Bridget inside with a flame thrower – but Gordon and the Gotham police are on to them. Bridget is strapped with a flame thrower, her brothers drive off and leave her in the alley when they see the cops. Bridget fights them off with the flame thrower and burns one of the cops badly and makes a run for it. Selina arrives and says that she is going to help Bridget get home – she drops her a ladder from one of the buildings. Theo heads home and finds Father Creo waiting for him, he shows him the knife that he had stolen and says that his work has been paying off. Father Creo is impressed, but he wants to know when Theo will have the Wayne boy. Creo says the “day of redemption is almost here.” He vows that Gotham will be redeemed in blood – and Bruce Wayne will die.